In the TLIG messages, the Lord often mentions that we live in an era of rationalism, decadence and disregard for His Laws and Commandments; in an era when evil and violence prevail. For this reason, as a tender and merciful Father, He has opened up His storeroom in Heaven to provide the hungry with rich spiritual nourishment. 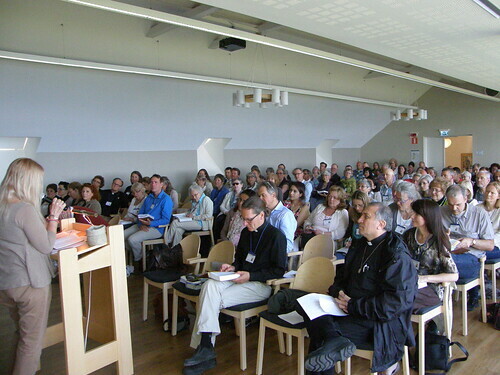 Our needs for not only spiritual contemplation, but also for communication among the people studying and experiencing the TLIG messages are some of the reasons why retreats are organized every year, all over the world. Participation in them is always high. 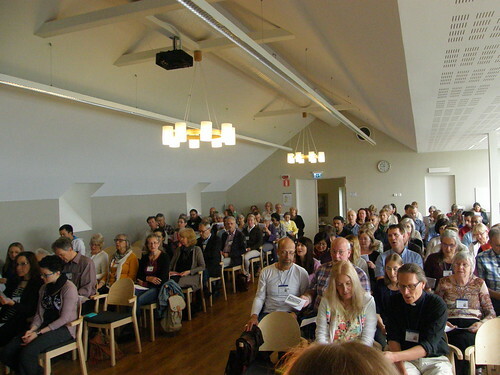 During the dates of June 4-8, 2014, the TLIG spiritual retreat to Vadstena, on the lake of Vättern, Sweden, took place. 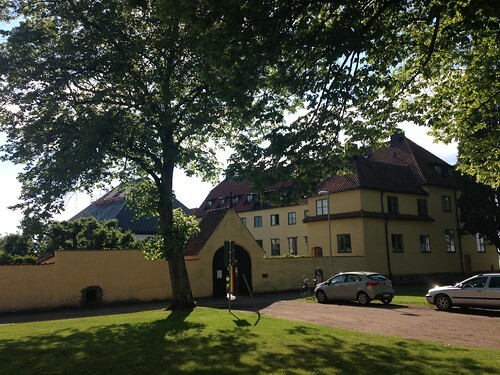 The city of Vadstena was developed around the Abbey of St. Brigitte, founded by her in 1346. In a peaceful, natural setting with a view of the lake, we experienced a wonderful journey of spiritual contemplation, prayer and communication among participants. 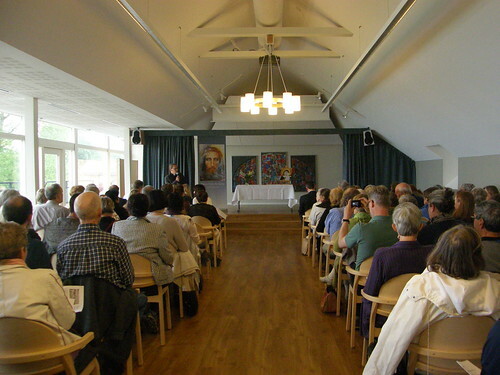 The organization of the event was the outcome of inspired work by the Swedish TLIG Association, in co-operation with Reverend Bo Westergaard. 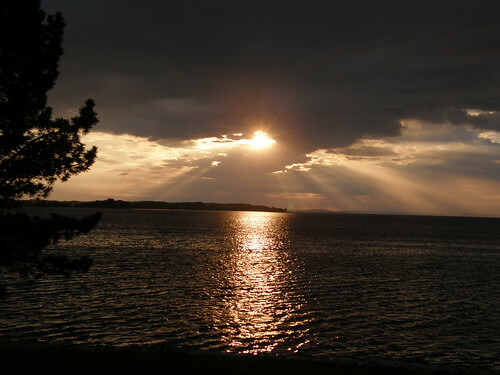 On Thursday June 5, our retreat began in the morning, in a bright room overlooking the great lake, with a prayer to the Holy Spirit, songs of praise, and a Bible reading. Reverend Bo welcomed Vassula, Fr. Nabil Mouannes from the Maronite Church, Reverend. 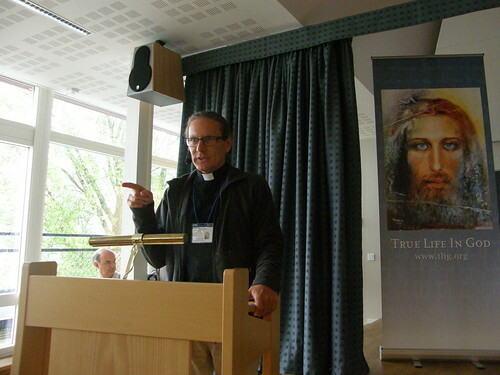 Magnus Lind, Reverend. 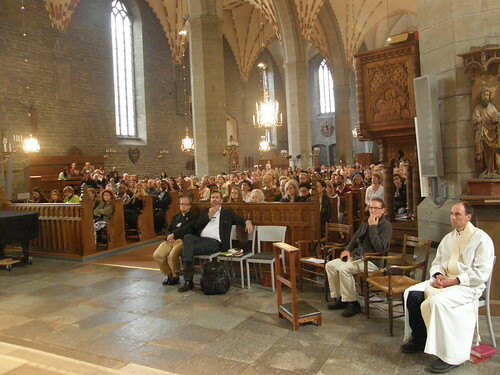 Niklas Bondesson from the Lutheran Church, monk Boris from the Benedictine Order and everyone present. 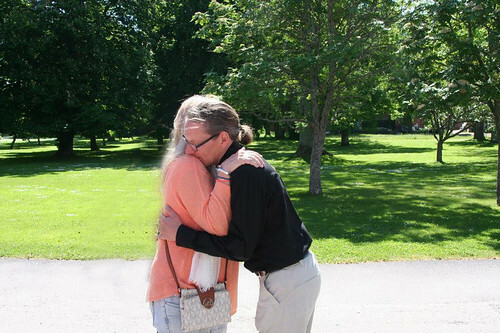 There were 120 participants; however, over the course of the weekend 100 more people arrived by bus or car from Stockholm, Gothenburg, Uppsala and other cities. 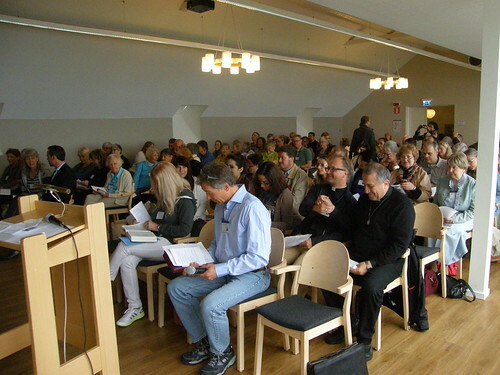 Participants were there from Sweden, Denmark, the Faroe Islands, Norway, Finland and Greenland. 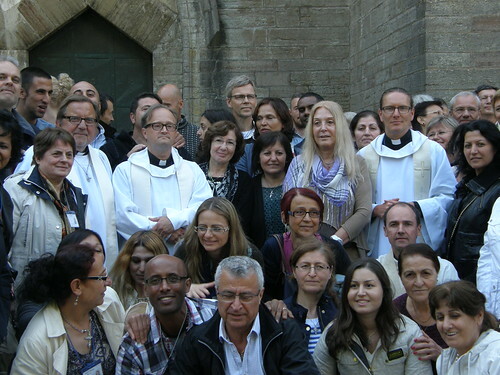 There were also people from other countries, such as France, Belgium, Greece, Iran, Colombia, Syria, Lebanon, Argentina and the USA. The schedule of this spiritual retreat included more prayers, songs, praises to God and silent contemplation, and a few speeches. 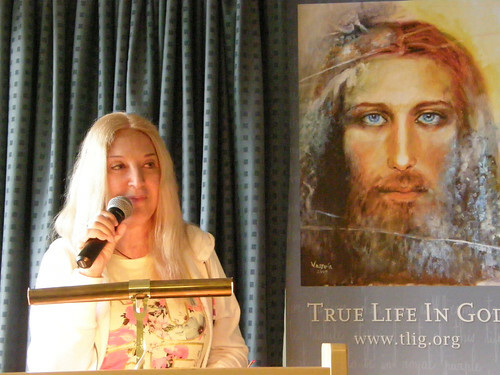 The daily reading out of the TLIG messages by Vassula, and the spontaneous interpretation and analysis by her, was a pleasant surprise which helped us achieve a better understanding of them and a more profound contemplation. Vassula began on the first day by reading the message of February 3rd 2003, which she continued reading and concluded the following day. This message referred to the Holy Trinity. She reminded everyone that Jesus asks that we substitute our name for hers, “and this is important, because what he asks of me, he also asks of you. The language of the messages is mystical and symbolic and to get to know God and understand Him, we need to get closer to Him…” Each day, when concluding her interpretation, she asked us to contemplate that day’s spiritual lesson: Who are we before God? What are we in the eyes of God? 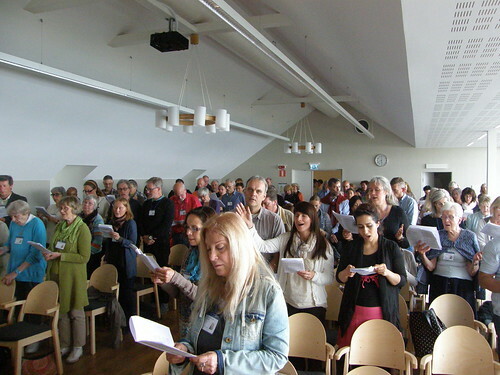 The Swedish TLIG group included people of various talents, which they used for God’s purpose: to glorify and praise the Lord and honor His Holy Name. Eve, Beatrice, Rev. Magnus, Rev. 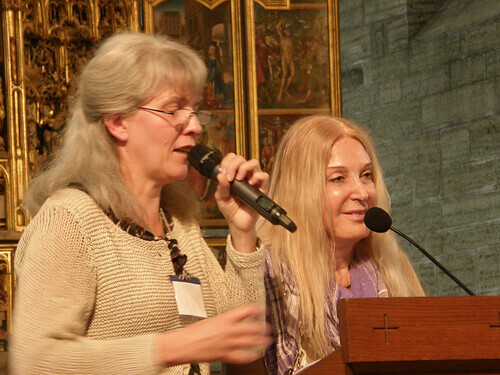 Bo, together with their beautiful voices, piano and the violin, uplifted our spirit to the divine and angelic. 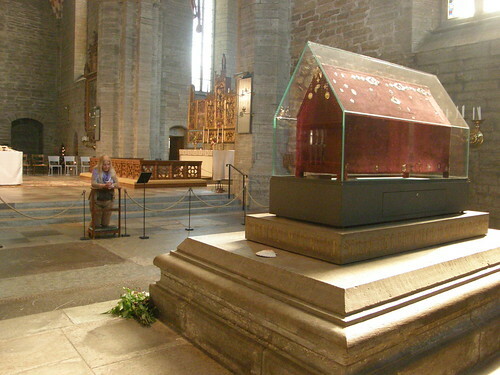 Later on this first day, after our TLIG message devotions, we walked to the medieval Church of Saint Birgitta, where there is a shrine containing her relics. 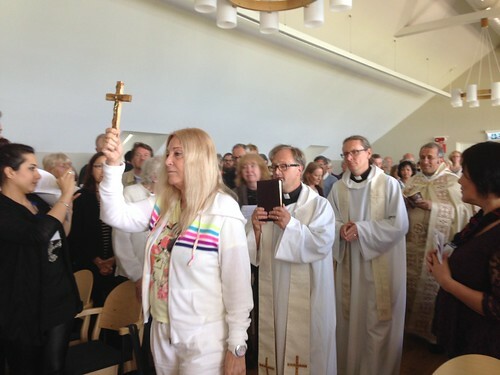 The Vicar Rev. 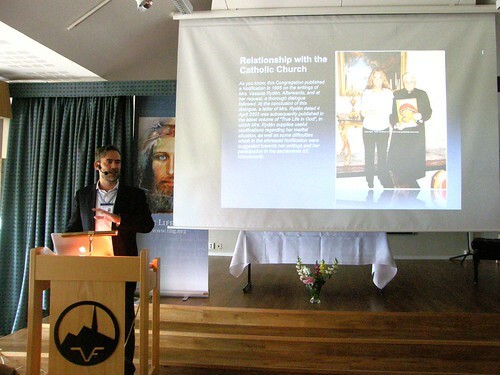 Torbjorn welcomed Vassula and the group and talked to us about St. Birgitta and the Church’s history. The church was built after the occurrence of a vision that the Saint had received. 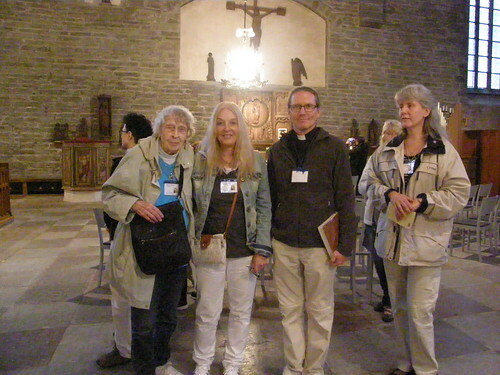 We were taken on a tour of the Church and admired the medieval sculptures and the carved stone on the floor. Before leaving, Vassula thanked the Vicar, Fr. 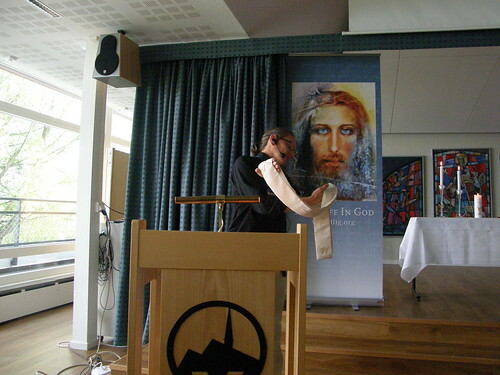 Torbjorn, for the warm welcome and the tour, offering him the TLIG one Book, which includes all of the messages in Swedish. 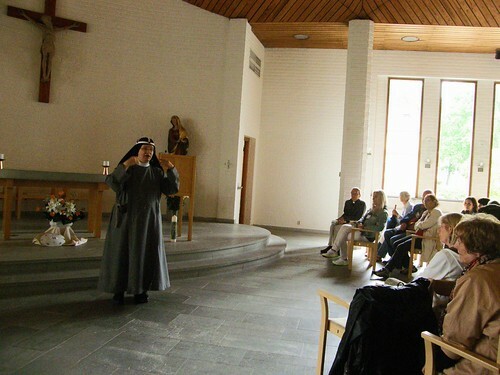 After lunch, we watched an interesting film on the history of the Abbey of St. Birgitta, along with the life and daily activities of the Brigantine nuns today: their chores and obligations, the work and duties assigned to each one of them, some interesting stories of their conversions, as well as their relationship with the local people. In the afternoon, we walked to the abbey. We were welcomed by Sister Monica, whom we recognized from the video we had watched earlier. 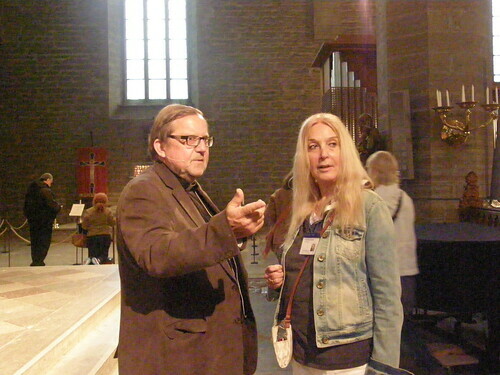 She spoke to us about the history of the abbey and replied to the questions of the people attending. 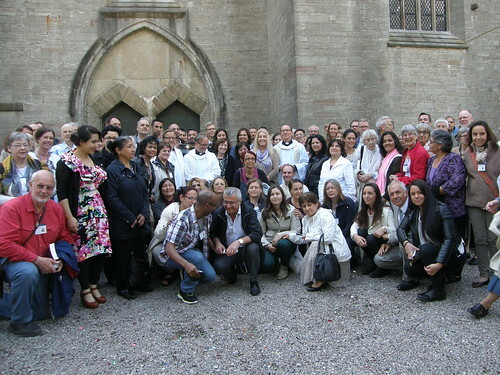 At the abbey, there are 10 Catholic nuns from 5 different countries. 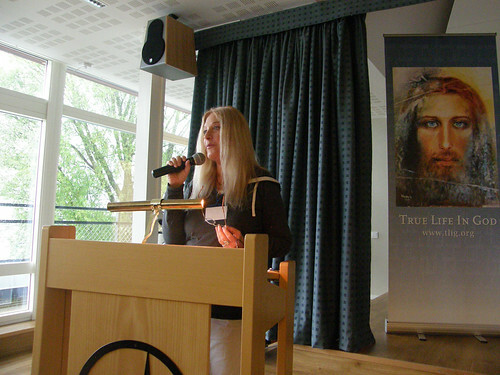 Sister Monica greeted Vassula, saying that she has the TLIG book in Swedish. 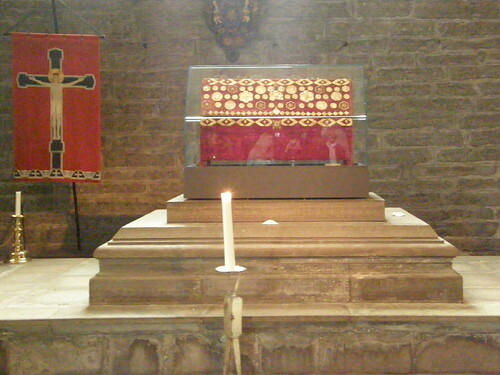 Vassula then gave her the book “Heaven is Real But So is Hell”, with a personal dedication. 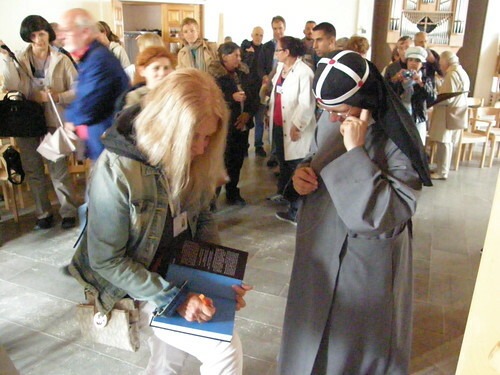 Sister Monica, tells the story of the monastery - Vassula writes a personal dedication in the book, Heaven is real, but so is Hell. 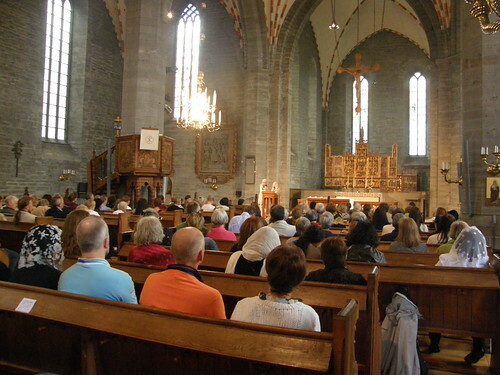 After our excursion, we returned to the hall where the Mass was celebrated by Fr. Nabil and the priests, followed by the rosary prayers and a prayer of adoration. 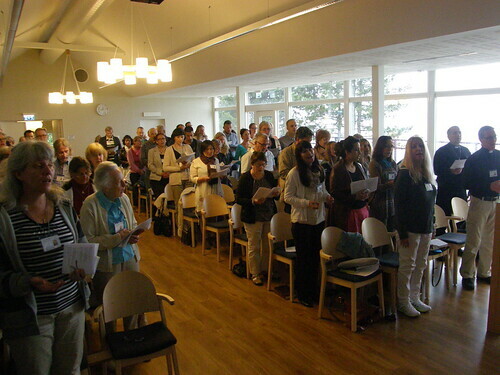 On Friday June 6, the day began with a prayer to the Holy Spirit through the TLIG messages (March 26, 1988), songs of praise accompanied by piano and violin, and a reading from the Bible. After these prayers and devotions, we read a prayer from TLIG (January 9, 1996), along with the prayer for the Consecration to the Two Sacred Hearts and some contemplation. Vassula continued reading the True Life in God message, conveying to us the way in which she hears the Lord dictating them to her, and reminding us that studying the TLIG messages contributes to our spiritual growth and gives joy to our Father in Heaven. With Eve at the piano, Fr. Magnus on the violin, Reverend Bo’s and the all of our voices filled the room and our hearts with melodies and the joy of the Holy Spirit. Fr. 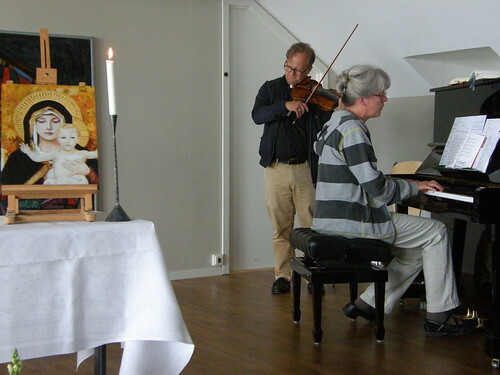 Magnus, who had studied music, the violin, the piano and vocals, gave up his career as a musician in order to become a priest. Ever since, he joyfully employs the talent given him by God in order to thank Him, praise Him, and glorify Him. After this activity, there followed a very impressive address-testimony by Niels Christian Hdvit, a theology professor from Denmark. The subject of his address was “The place of prophecy in the Church”. Obviously touched, he referred to his journey to Patmos and how it had shaped his life, his acquaintance with Vassula and the TLIG messages and God’s plans for him and His message until today. 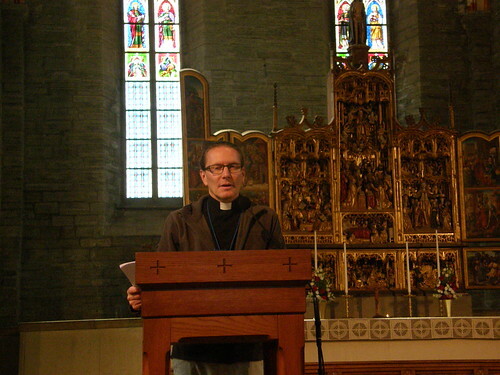 In his address, Niels pointed out two common elements appearing in both Saint Birgitta’s mission and Vassula’s mission: one is Church unity, and the other is that both were sent to and lived in Rome, where they met the Pope. You will soon have the opportunity to listen to his testimony on TLIG Radio. 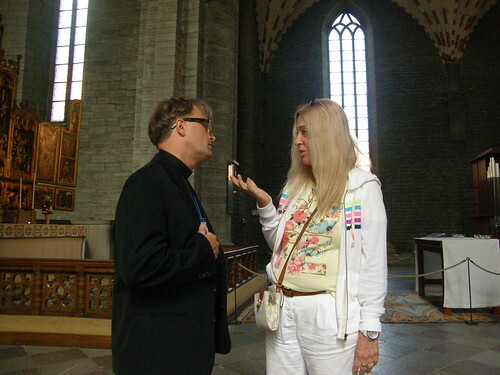 At 2 o’clock that afternoon, at the medieval Church of Saint Birgitta, Vassula’s address was scheduled and began. The Vicar Fr. 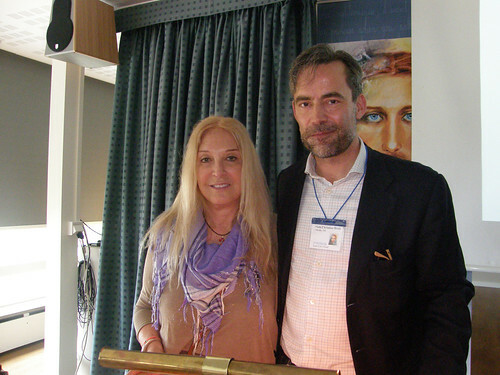 Torbjorn welcomed Vassula and the people who had come from other cities of Sweden to listen to her address. Fr. Bo introduced Vassula and invited her to speak. 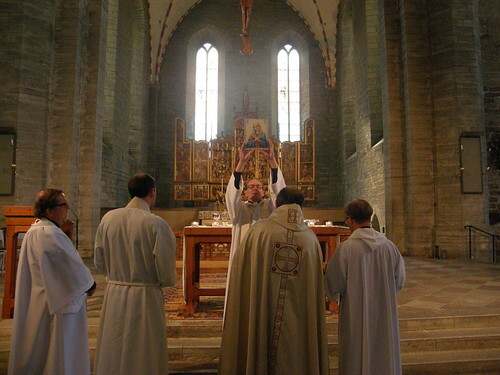 After our photo session, we returned to the hall for the Healing Service by the priests and Vassula. 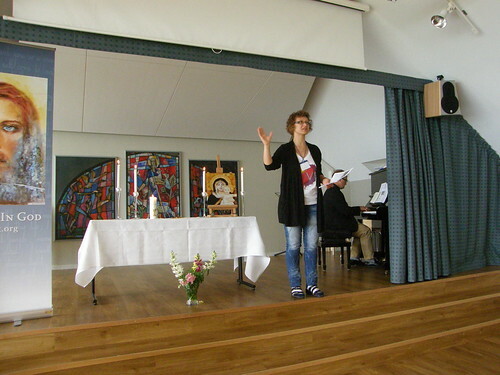 On Saturday, June 7, our day began with songs and praise again, always accompanied by the piano and the violin, followed by prayer to the Holy Spirit, a Bible reading and silent contemplation. Vassula said that the book “Heaven is Real But So is Hell&rdquo; is her autobiography. It is a short outline of her life. It is a narrative of events that took place before her call from God. It has been written for people who are not acquainted with God, and it is a book that serves as an introduction to the TLIG messages. After she had asked Jesus to indicate a message for our retreat, she opened the One Book and read a message. Then Fr Nabil after thanking Vassula, Rev. Bo and the organizers for the invitation to attend this gathering, spoke about "Healing in the Holy Spirit"
The program continued with the Holy Mass, the rosary prayers, and the prayer of adoration. 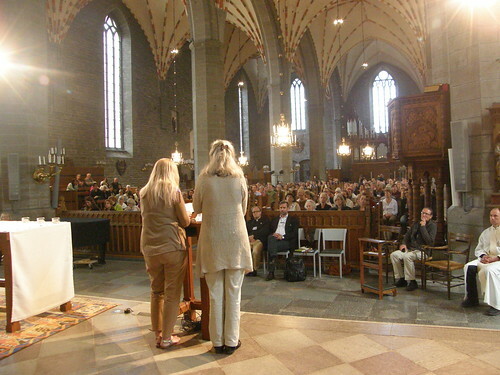 Our spiritual retreat to Vadstena concluded with the spontaneous testimonies from people who had converted through the TLIG messages. As we listened to them, we found out, once again, how unpredictable, inexhaustible and indescribable the Bridegroom of our souls is. 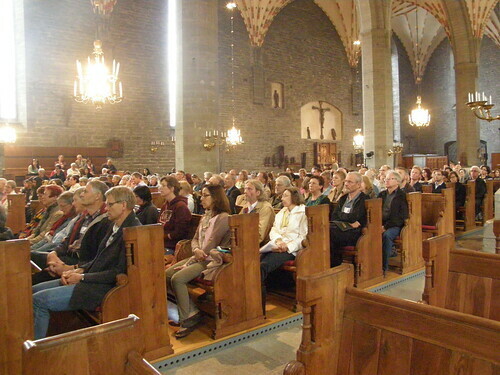 During all of these days in Vadstena, we lived in a peaceful and blessed atmosphere, with a spiritual uplifting and the joy that only the Holy Spirit can give. We practiced more profound contemplation, which is also the fruit of our union with God. Our hearts and souls were filled with the gifts and blessings that God generously gives to His children. We met dear friends we had not seen for several years, and it was as if no time had passed, as if it were only yesterday that we had previously seen one another, but mainly, as if we were kin… We met people we had never seen before, and it was as if we had known each other for years. We felt the warmth and intimacy that comes from the Presence and the Grace of the Holy Spirit!